One of the great things about being located in a small community (where everyone knows your name), is that good people are always interested in the programs and activities of the local community, including our station. One of the big interests currently is the Great River Road Interpretive Center that is being constructed this winter at the Genoa hatchery. Even though the project seems to be taking a long time to complete, many people still mention that they are very anxious to see the completed project. Others, hearing that there will be a local history exhibit in the building, have also volunteered sources and other historical items of local interest to be included in the project. Historians and local authors have also reached out to share their wealth of knowledge in order to interpret the breadth of history that we are blessed with in the local area. One such historian, William Burke, stopped in to check on how the building was coming along. He also passed along a very interesting piece of history that we were unaware of. 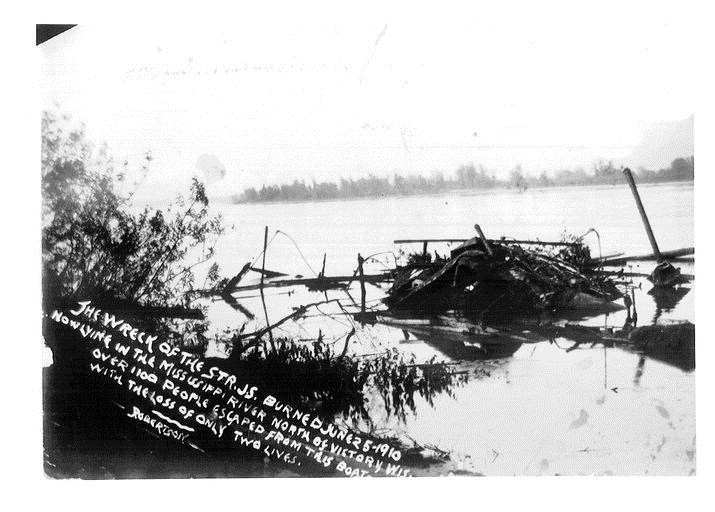 In 1910, a paddle wheel steamboat that was used as a touring/excursion boat caught fire and sank just out-side the hatchery exterior dikes. The steamboat J.S. 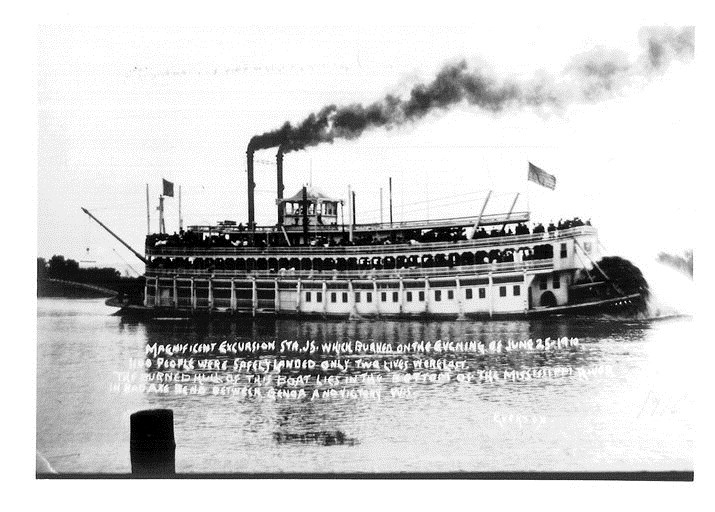 was returning from La Crosse to its destination of Lansing Iowa on June 25th,1910 with over 1000 passengers. The ship departed at 6 p.m. from La Crosse, and was almost directly adjacent to Bad Axe Island when fire broke out. This location is just south of the hatchery exterior dikes. 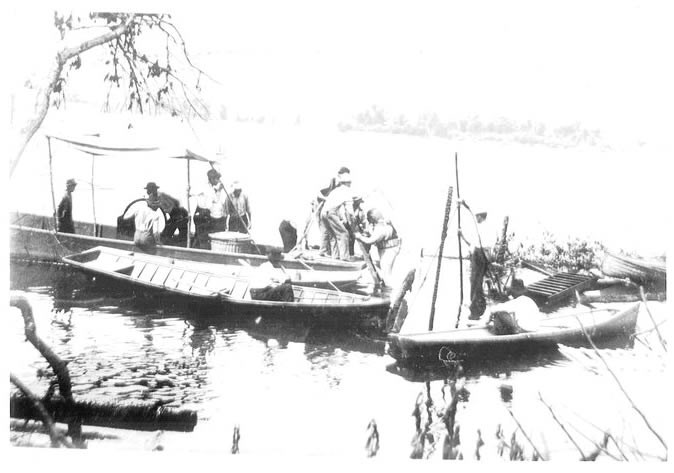 After some quick thinking by the captain and crew, the boat made shore on Bad Axe Island to offload its passengers. Most made it off by the gangplank; however about 2-300 passengers had to jump in the river from the upper deck as the first deck was totally engulfed in flames. The evacuation resulted in at least one tragic death, a young married woman that was pregnant with the couple’s first child. The only other casualty was a male passenger that purportedly was under arrest for drunkenness in the hold, and may have allegedly been responsible for starting the blaze by careless smoking. Once the passengers disembarked, the captain and a skeleton crew directed the burning ship back into the channel to get it away from the passengers on the island and it floated directly downstream and sunk burning to the waterline.